Chocolate Lovers will welcome this gift. The brand will vary. Send this big box of chocolates with flowers or a plant. 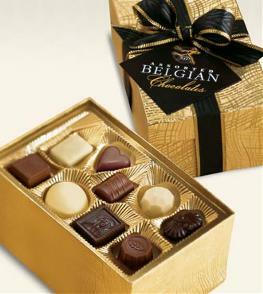 Florist Notes: The image shows Belgian Chocolates. But the brand name will vary from region to region. May contain nuts or nut oils. Arrangement Details: Varieties of chocolates will vary. Always selected and delivered by a local florist. Add a large card, helium balloons or even a teddy bear.